Hubby and I had been practicing ready for the singles knock out this evening, though he has been in so much pain these last few days, we didn’t play over the weekend and it showed. We had changed our warm up from Mickey Mouse to doubles round the board 1 to 20, then the following day 20 to 1 before playing our games, and were pretty evenly matched. However, we bypassed that yesterday and today, and although I won one game, Hubby won the other two we played. 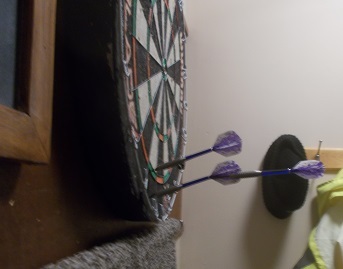 Robin Hood is running rampant in our house. I shattered another stem today and my flights have been harpooned three times in the last week. 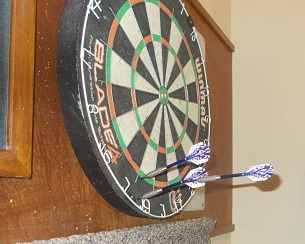 This entry was posted in diary, games, humour and tagged darts. Bookmark the permalink. Great marksmanship! Or should I say woman ship! sadly only dart points that stick in the board count (sob) !! But it’s a thing to be proud of. Robin Hood was!